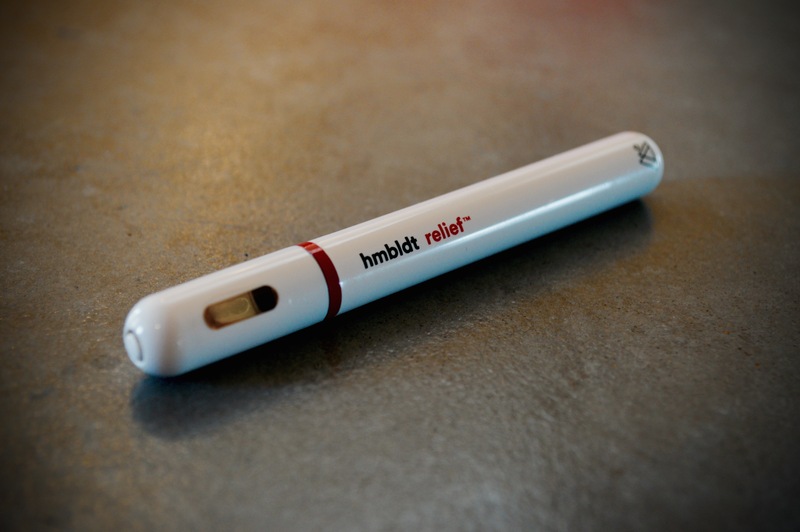 Edit: The hmbldt pens pictured and discussed in this blog are now known as dosist. The company re-branded in January 2018 and these pens are still available all over California! Seen any cool cannabis vape pens out in public lately? If you’ve been to a party or music festival in recent months, or traveled within legal cannabis territory for the holidays, it’s likely you have. Vape pens, in my opinion, have totally opened up a new world for people who want to smoke weed discreetly. They’ve become more than just a smoking device, though. Many of the newer models are raising the bar for clean, quality medicinal cannabis concentrate vapor and next-level technology. A vape pen allows nearly the same fast acting effects and ease of use as your regular everyday joint – except that there’s no fire, tar, smell or smoke involved. Just some heated concentrated liquids trying their best to become gaseous and work their magic on you. When using a vape pen there should only be a minimal aroma and barely visible puff of vapor from your mouth. This stuff is getting really mainstream. 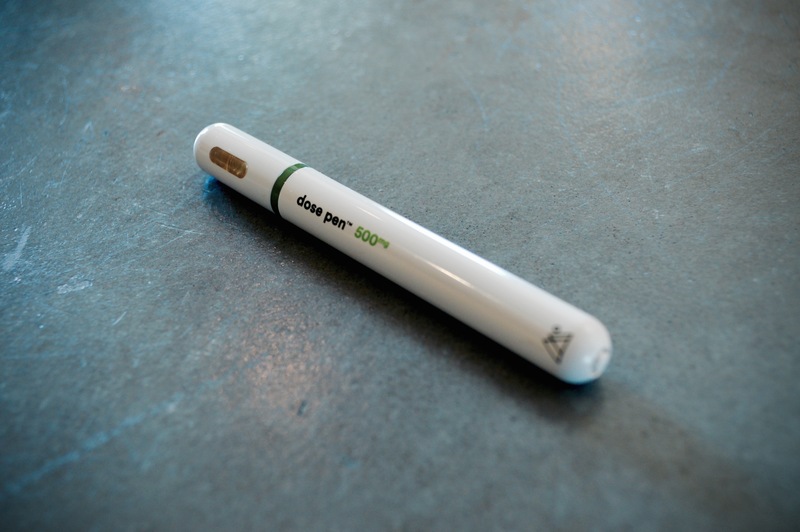 In a dramatic first for cannabis products, TIME’s 25 Best Inventions of 2016 included one of my personal favorites from the year, the dose pen line by a Northern California company called hmbldt (now known as dosist). The dose pens stun with impeccable design, function and flavor. With their beautiful white build, they look more like a medical device than a cannabis vape, making them ideal for traveling, hiding, and sneaking a toke in tight spaces. I was lucky enough to receive two samples at an event a few months back: one of their pain-relieving formulas as well as the “bliss” formula for naturally lifting the mood. Check me out talking about these amazingly high-tech vapes with my friend Cat Goldberg of BrainBuzz. dosist currently offers six dose pen formulas: their original line: bliss, sleep, calm & relief; as well as their two sexual enhancement formulas: passion & arouse. Don’t worry if none of these really tickle your fancy – the company is already underway researching more effects, like energy and focus daytime formulas! I can’t wait for that. A little reflection for you on vape pens. Back in the day, when vape pens first became a thing, they were more of a novelty. The CO2 oil contained within the cartridges was mostly cut with fillers and fluids, never had a good flavor, and the cartridges would constantly leak and short out, rendering them a useless waste of cash more often than not. Unfortunately, there are a ton of companies who still think this is okay, and continue to put out cheap cartridges and oil instead of innovating. The dosist dose pens run pricey at $100, but when compared to how many $30 cartridges you’ll break, and considering the fast-acting medicinal properties, it’s unbelievably worth the price. Plus, you can recycle your old empty pens back to the company for a discount. These are available only for verified Prop 215 patients in California. Now – I’m not saying these dose pens are the end-all for cannabis vapes. There are some less expensive cartridge companies out there who are really doing the thing. For example, check out my latest review of the new Gio vape pods by Caliva, my pick for vape pen setup of the year! Eaze is my favorite way to order vape pens in a time crunch – and they’ve got a great selection. Check them out and save $20 off your first order when you use my special link. Which vape is in your bag these days? Let me know your favorite by leaving a comment! Awesome post! I’ll have to look into these vape pens soon. Thanks for the find! I just bought mine 2 days ago, only used it once. Already not working and cartridge is full. Total bummer, pricy too. Oh no! I’d highly suggest making a complaint to the dispensary you got it from! They should have some kind of policy for you to return it as long as the oil chamber is full! i dropped mine when i was really relaxed. the case cracked. never worked well after that.